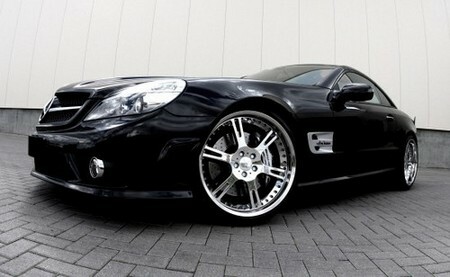 Mercedes SL63 AMG is really an all-in-one car. It’s a coupe, a convertible, a two-seater sportscar, a comfi grand tourer, and it’s got a weapons-grade V8 engine. But there’s still room for improvement, and that’s where the tuners come in! Here’s Wheelsandmore take on this fab car. As usual they have bolted some of their fancy 20-inch rims on the car, but the main feature if this car is the engine. That 6.2 liter V8 has been upgraded to 600 hp and 710 Nm of torque. To achieve this level of power the tuner has remapped the car ECU, installed 4in1 manifolds, and replaced the exhausts system with a sport stainless steel one which has electronically controlled valves for extra exhaust noise when you feel like it!